The two components of composite work (reinforcement and resins) always require attention to safety. Reinforcements will tend to provide a problem when cutting. The small fibers will travel through the air so care must be taken to avoid breathing these fibers. 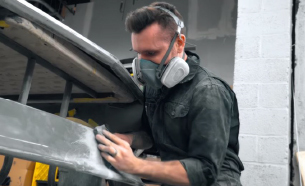 Often a dust mask is satisfactory, but a respirator offers more complete protection. You additionally will need to vacuum frequently to avoid having the fibers continue to circulate in the air. Reinforcements can also be irritating to the skin. Some people seem to be more susceptible than others to this problem, but sensitivity can also be developed over time. In other words, there are many cases where an individual showed no particular sensitivity to cutting fiberglass and then began to have problems. Skin sensitivity is generally an itching, a rash , or both and varies in intensity among individuals. The best way to protect your skin is to wear gloves and long sleeves when cutting or handling the reinforcements. Resins are liquids which turn into solids through a chemical reaction. It is necessary to work in a well ventilated area while working with the resins as well as when they are left alone to cure. 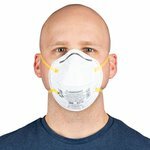 Respirators are often used when working in a closed area where ample fresh air can not be circulated. You also need to prevent the resins from contacting your skin or eyes. 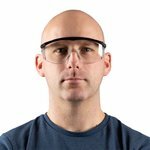 Wear protective goggles and gloves when working with resin. Below, you can find product examples of some of the common safety and cleaning supplies you'll find within the average composites shop. 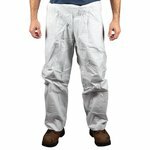 For a more details list, be sure to check out our store page under Safety and Cleaning supplies. 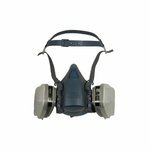 Organic Vapor Respirator Wearing a Vapor Respirator will protect fabricators from dust, fumes, vapors and gases. Vapor cartridges contain granulated charcoal treated to absorb organic vapors that pass through with the air you inhale. 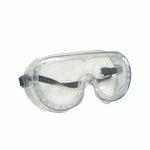 Safety Goggles In order to protect fabricators eyes from vapors, chemicals and other substances fabricators must way a pair of impact resistant safety goggles. These goggles come with a polycarbonate coated lens that helps resist impacts and nearly 100% of harmful UVA?UVB rays. 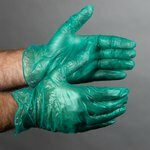 Flock lined Latex Gloves While standard latex and vinyl ester gloves are good for some projects, these flock lined latex gloves are thicker, heavy-duty and just right for protecting your hands from any resins or solvents. 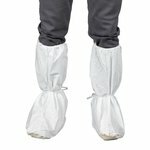 They can also be cleaned for more than one use, or pitched after the project is complete. Disposable body Suit Laminating can be a dirty job. 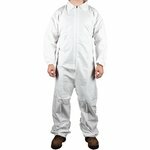 This maxshield made disposable body suit offers a double layer of full-body protection that holds off dirt, aerosos, spills and splashes. The following is a list of Fibre Glast Developement Co. products currently requiring hazard labeling for shipment and an explanation of the hazard type. These are all considered flammable liquids. Each of these products has a flash point lower than 100°F. This means that vapors of these products can ignite at temperatures lower than 100°F if presented with a direct ignition source. The lower the flash point, the more flammable a material is considered to be. Consequently, when working with any of these products, you should have plenty of fresh air and avoid all sources of ignition. MEKP is an organic peroxide. Although it has a flash point higher than 100°F, and is not considered a flammable liquid, it has a unique fire hazard. If an organic peroxide such as MEKP ignites, it produces its own oxygen which makes it quite difficult to extinguish. Consequently, MEKP should be stored in a cool place away from flammable liquids and away from direct sources of ignition. Some epoxy hardeners are considered corrosive and must be transported as hazardous chemicals. Special attention should be given to keeping these materials out of eyes and away from skin. Compressed gases whether flammable or not are treated as hazards when shipping. There are a variety of rules pertaining to air and ground shipment of hazardous chemicals. The following is offered as an explanation of the rules and charges which generally affect our customers regarding ground shipments. We are permitted to put only one type of hazard in a single box. Each box containing a hazard is required to have a special set of labels with the proper hazard designation. In many cases, we are also limited to the quantity of material which may be shipped in a single box. Additionally, each carrier charges a surcharge for handling a hazardous box. These surcharges can be quite expensive and we will ship via the least expensive carrier to our customers unless otherwise specified by the customer. We try to minimize these surcharges for our customers when placing orders as well as when shipping. All manufacturers/suppliers of chemicals are required by law to produce an SDS which can be made available to you upon request at no charge. The SDS is a relatively standardized form which offers health and safety information about any particular chemical or material. SDS's are available for nearly all materials; not just those which are considered hazardous. Product and Company Information: Includes the product name (and sometimes other common industry identifiers); manufacturer/distributor name, address, phone number; an emergency contact phone number; and recommended use. Hazards Identification: Includes all hazards regarding the product, including GHS-compliant pictograms, specific hazard statements, and precautionary statements that provide direction in case a hazard is experienced. Composition and Information on Ingredients: Details chemical ingredients by an industry chemical identifier called a CAS number and by percentage of total product; also details proprietary trade secrets, if necessary. First Aid Measures: Identifies important symptoms and effects of exposure, acute and delayed, as well as the necessary steps of immediate treatment. Fire-Fighting Measures: Lists suitable extinguishing media, equipment, and procedures; also details chemicals hazards of fire. Accidental Release Measures: Lists emergency procedures, protective equipment, and the proper methods of containment and cleanup. Handling and Storage: Includes precautions for safe handling and storage, including incompatibilities. Exposure Controls and Personal Protection: Lists OSHA's Permissible Exposure Limit (PEL); Threshold Limit Value (TLV); appropriate engineering controls; and personal protective equipment (PPE). Physical and Chemical Properties: Provides an overview of the product's characteristics. Stability and Reactivity Defines chemical stability and possibility of hazardous reactions. Toxicological Information: Includes routes of exposure; related symptoms, acute and chronic effects; and numerical measures of toxicity. Ecological Information, Disposal Considerations, Transport Information, and Regulatory Information: Includes regulations imposed by other governmental agencies; as a result, these sections are not required by OSHA and are only provided at the discretion of manufacturers/distributors. Other Information: May include disclaimers by manufacturer/distributor and revision dates, etc.